Mom (84) & Dad (89) live independently in Illinois. Mom’s doctor says she needs 24 hour assistance; Uncle Jim (87), who lives next door, says all Mom needs is a little help with cleaning and cooking; Dad says, “Don’t worry, I’ve got it under control.” If the conflicting descriptions weren’t bad enough, visualizing my demented Dad having “it under control” scared me silly—it’s been years since he remembered Wednesday comes after Tuesday. So I flew to Illinois for the weekend and accomplished almost nothing because the doctor and most other resources are closed over the weekend. I returned convinced my parents needed help but have no idea how to accurately determine what type of help or where to find it in the community. Is there a simpler way to handle this? You are not alone; millions of “long-distance caregivers” face similar problems. Right now you’re at the mercy of your family’s conflicting descriptions of your parent’s status. The reason you “haven’t a clue” is because you don’t have enough information to make informed decisions. It doesn’t matter if you see your parent every month or once a year; you’ll need the same information to determine how to intervene. Assessment: This is a task for a professional. Your best bet is to hire a geriatric care manager in your parents’ community to assess your parents’ current status, healthcare needs, and potential risks. Assistance: Once the Care Manager determines your parents’ status she’ll recommend steps to keep them safer and healthier. She can create a care plan for you to follow or you can retain her to implement the suggestions you approve. 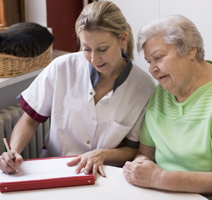 Retaining the Care Manager will allow you to communicate regularly with someone who can visit your parents and provide objective evaluations of their needs and status. Physicians: Ask the Care Manager to provide you with a complete list of the names, addresses, and telephone numbers of your parents’ physicians. It is critically important to establish communication with them. Ask them to keep you informed of your parents’ status so you can help.